I love a good accessory. Nothing compliments an outfit more. The right accessories can transform a simple t-shirt into the most elegant evening attire. If I had to pick one accessory to wear above all others, it would be a watch. Watches are my favorite and I've grown quite the collection over the years. They are so many fun options, and I love that it's a functional accessory that will always be in style. I'm always on the hunt for a new one, and my new favorite is this nautical inspired one from Grayton Watches. When I was introduced to Grayton Watches I instantly fell in love with several of their pieces. The traditional style and classic elegant faces are beautiful. As a lover of anything with a preppy or coastal feel, I was drawn to their fabric strap options. I wanted something a little more casual and fun for summer, and thought this one would be perfect. I love the navy face and striped band with the rose gold touches. The quality is superb and I love it is an automatic watch and I won't have to replace the battery ever. Simply walking will keep it wound and in perfect time. Plus I absolutely love the look of the open back. The watch has definitely been fun to wear, and has become a go-to for any event. It's been comfortable to wear from baseball games to playing with the kids in the yard to evening nights out. I've received tons of compliments on it and even Mr. Cute has borrowed it a time or two. Speaking of gifts, the watch surprised me when it came wrapped so well. The packaging was just as elegant as the watch, and if gifting one to someone I love that it's already ready to present nicely even if it has to be shipped for a someone special out of town. I am definitely a new fan, and will be keeping my eye out on Grayton if I want to add a new watch to my ever growing accessory collection. 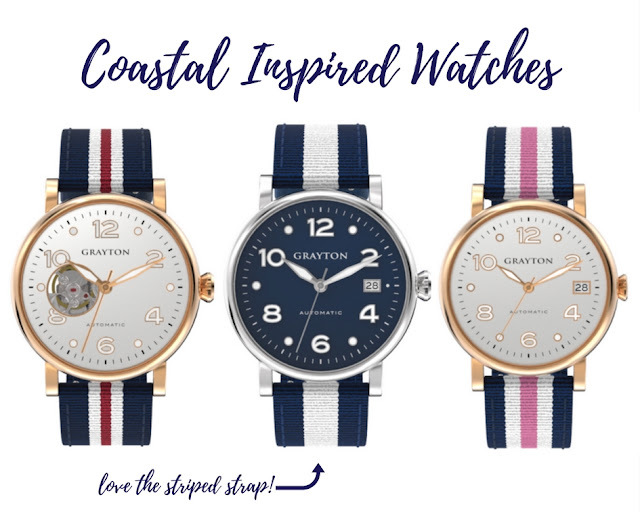 I've been so excited about my new watch, that my lovely new friends at Grayton Watches have given me a discount code to share with you in case you want to add one to your collection too. Use code Flcom-Grayton15%-TheMagnoliaMamas for 15% off your entire purchase. Which Grayton Watch is your favorite? **I was given this product by Grayton Watches in exchange for review. All thoughts and opinions are my own.